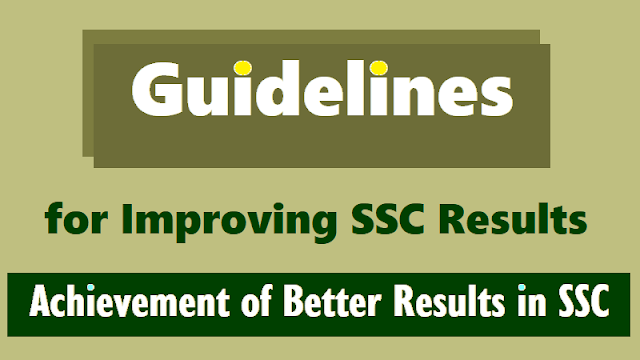 Guidelines for Improving AP TS SSC Results/Achievement of Better Results in TS AP SSC 2018: The Principals/ Headmasters of Secondary Schools in the district are informed that in certain colleges/Schools the SSC public Examinations results are poor in the past few years. tn ordered to ensure quality of Education to improve standards and the Academic performance of the students achievement of better results in SSC Public Examinations, March-2018,the following steps has to be taken up by the Principals/Headmaster concerned. 1. Conduct special classes in the morning and evening daily, giving more weightage to the difficult concepts. 2. Complete the syllabus in each subject as per School Academic Calander 2018. 4. Provide additional study material to the students. 5. Conduct monthly meetings With the parents of X class students starting from the month of December 2015 to review the progress of each student in all subjects. Request the parents to ensure for regular attendance of the Students and providing for study at home. The parents whose children are toppers should be requested to talk and share their experiences with other Parents. 6. Start through revision in each subject after completion of syllabus. 7. See that any teacher should not discourage any students for poor performance, instead encourage the students and built up confidence. 8. After analyzing the results of unit test/terminal exams identify the week Children in each subject and take steps to improve their performance. 9. All subject teachers should adopt weak children of their subject for improving performance in their subject duly paying special attention. 11. After conducting the test arrange to evaluate the answer script immediately and bring the correction/mistakes, if any to the notice of the students. without valuating the answer scripts of the previous test, the teachers should not conduct one more test. The Headmaster has to supervise all teachers and periods in this aspect. 12. All subject Teachers shalt make the X class students to practice the model Question papers of each subject. 13. The headmaster should conduct weekly subject review meeting with X class subject teachers to review the performance of students in each subject. The Headmaster should personally interact with students on their performance at least once in a week. 14. All subject teachers should maintain progress reports of their subject. 15. Head master to arrange inspiring/motivating talks by the topper and previous batches of X class from the school. 16. Conduct oath taking daily by X class students every day in their class room. 17. Headmaster has to act as team leader. There is no target. The only target is that every child should pass the X class exam. 18. Children may face stress during preparation period and exams. One of the teachers who have motivational capacities may be designated as X class children counsellor. He /She should be able to interact with the children and give personal counselling as an when required. All the Principal/Headmasters are requested to bestow their special attention to this item of work and ensure better and qualitative results in the ensuing SSC public Examination March-2018 and make the district top in the state. Adverting to the subject cited all the Head Masters in the District are hereby requested to follow the guidelines to improve SSC results in March, 2018. 1. Friendly relation may be maintained with students and parents for their regular attendance to the schools. 2. Read the Academic Calendar thoroughly and implement the programmes which are shown regularly. 3. See that the syllabus to be completed by December, 2016. 4. Conduct special classes to the students morning and evening. 6. Conduct Parent-Teacher Meeting regularly and discuss about the health and behavior of the students and advise them to give good food at their houses. Tell their academic standards also. 7. Take the slow learners list from the Subject teachers and advise them to give needful coaching separately. 10. Take the students names those who passed in 5 subjects and failed in single subject. First concentrate on that subject, next passed in 4 subjects (failed in 2 subjects) and so on. Then the school result will be improved. 11. Observe the classes regularly and note the teaching learning process in class rooms. Advise the teachers about their goals. 12. Notes corrections, Project work, Lab activities, Maths home work, Social and Language works regularly may be monitored. 13. CCE Cumulative Registers should be filled completely. Progress reports should be sent to parents. 14. Take phone nos of parents and contact them regularly. 15. Conduct more tests like special tests and assignments regularly and see that the student should not feel fear about exams. 16. Observe the answer scripts of S.A. exams and see that the students standards. Give feedback to the students on the strength and weakness of the students. Answer scripts should send to parents and so as to inform the progress of the children and take the signature of the parents on the answer scripts. 17. All the TIMs are informed that a State/District level monitoring teams are going to visit all the schools and will see the standards of the students. 18. They will also observe the answer scripts , implementation of CCE , quality of class mom transaction, annual plans, lesson plans , utilization or existing resources such as labs, library, TLM, school infrastructure , Haritha liaram, cleanness etc. 19. All the Head Masters are requested to follow the above guidelines for the improvement of SSC results March, 2017. 1n addition to this they can implement the other programmes with the consultation of staff.